Kailee Dunn, a senior at Eastern Washington University, was named Miss Spokane 2014 on Sunday at the Bing Crosby Theater. Dunn received a $1,000 cash scholarship and a $12,000 scholarship to Gonzaga University. Hannah Robb was named first runner up and also received the Touch of Class Award, the Four Points of the Crown Award, the People’s Choice Award and the Fianna Dickson Interview Award. The awards totaled $1,190 in scholarships. Robb also attends EWU. Second runner up was Ashlee Karras, a student as Spokane Community College, who also received the Ticket Sales Award, Miss Congeniality and the Liz Legacy Talent Award. These awards totaled $650. Other awards: Irena Martin of Washington State University-Spokane, $100 for the Spokane Academic Award; Mikayla Scharnhorst of Whitworth University, Most Improved, the Photogenic Award, and nonfinalist interview, totalling $200 and a photo shoot with Rocky Castanada Photography and Creative Solutions; Sondra Willmann, of Whitworth University, Pageant Personals Award, $25; Becca DeLong, Spokane Community College, Program Ad Sales Award, $345; and Erica Runyan, Washington State University-Spokane, nonfinalist talent, $100. 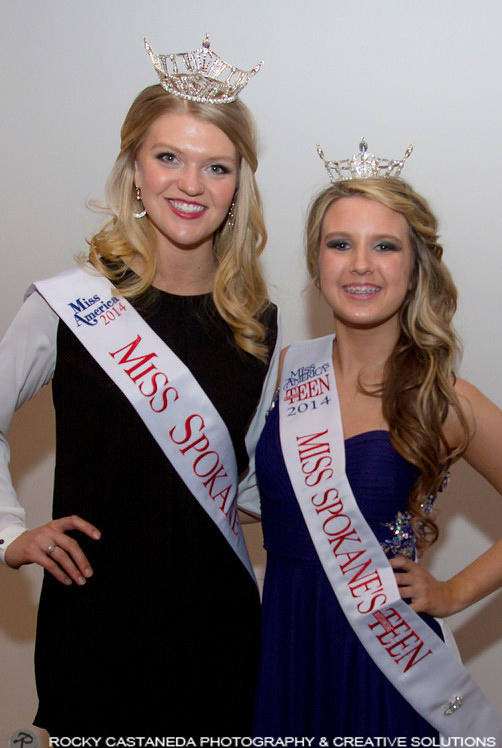 The organization has named Elaina Reid, of All Saints School, as Miss Spokane’s Outstanding Teen 2014. Reid received a $500 cash scholarship. Other awards: first runner up, Taylor Yocum of Lakeside High School, Pageant Personals Sales Award for a total of $275 in scholarships; second runner up, Jenna Reid of All Saints School, $175 cash scholarship; Annika Erickson, Northwood Middle School, Touch of Class Award, Academic Award and nonfinalist interview for a total of $300 in scholarships; Sierra Bolen, Garry Middle School, Most Improved Award (a tie), $100 in scholarships; Madison Nesbitt of Sacajawea Middle School, tied for the Most Improved Award, the Photogenic Award, Ticket Sales Award and Miss Congeniality, for a total of $250 in scholarships and a photo shoot with Rocky Castanada Photography and Creative Solutions; Andrea Muraoka of Ferris High School won the People’s Choice Award and nonfinalist talent award for a total of $230 in scholarships.